American Idol Season 6 Winner! 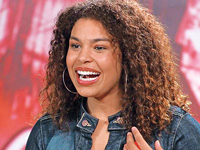 Jordin Sparks may have been the youngest American Idol when she won the title on the reality show’s sixth season, but the Glendale, AZ, resident had already packed plenty of accomplishments into 17 years. The daughter of Phillippi Sparks, former left cornerback for the Dallas Cowboys and former defensive back for the New York Giants, Sparks had no formal vocal training, but showed a flair for singing while still a toddler and was drawn to performing of all kinds at an early age. By her early teens, Sparks was singing, acting in plays and modeling, and already winning acclaim for her talents. Along with performing with Alice Cooper and Michael W. Smith, she was Coca Cola’s Rising Star in 2002 and made her recording debut with 2003′s For Now EP with CCM artist Matthew Ward and engineer Gary Leach. The following year, she won two awards at the 2004 Gospel Music Association Academy, placed second overall in that year’s Music in the Rockies competition, and appeared on America’s Most Talented Kids twice. In 2006, she won a plus-size model search held by the Torrid clothing line and appeared in an ad for Torrid in the December issue of Seventeen magazine. That year, Sparks also auditioned for American Idol, performing in the Los Angeles tryouts; while she didn’t make the cut, she later won the American Idol-affiliated contest Arizona Idol, which allowed her to audition again for the show in Seattle. She made it through to Hollywood on the strength of her rendition of Celine Dion’s “Because You Loved Me” and found a place among the 12 American Idol finalists early in 2007. Her performances of songs such as “I (Who Have Nothing)” and “Hey Baby” showed her charm and versatility, and soon made her a fan favorite. Like fellow American Idols Kelly Clarkson, Carrie Underwood, and Taylor Hicks, Sparks was never in the bottom two or three performers throughout the entire competition. Ultimately, Sparks beat out Blake Lewis and Melinda Doolittle to become the sixth American Idol on May 23, 2007.